The Daley Pillow Top is from the touted, award-winning "Comfort Care" line by Restonic Mattress. It's one of the favored mattresses in that line because of the tempered pocket coil (individually wrapped spring), new AirFlow ventilated edges and build up of plush-but-supportive foams. Falling right in the middle feel-wise, couples usually find this model to be a luxurious compromise that works for both partners. A strong edge nearly eliminates motion transfer and eight handles make this model easier to turn and flip; so that you get the full life out of a great product. Available in standard and customs sizes and, offers an optional steel semi-flex matching foundation. CertiPUR-US foams. If you came seeking the Belvedere models, this is their replacement. 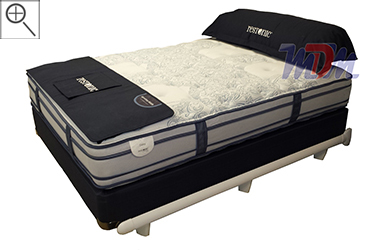 The Daley Pillow Top has become the most popular mattress on the sales floor and has a very distinct pocket coil feel that seems to satisfy the wants of a wide range of customers. Sleeping on your hip/side in this model is great because the innerspring contours to your hip and the model offers a very nice buildup of layers in between you and the spring, itself. Restonic has put together a nice level of support in this model as well, even though it's reasonably soft. Improving on the Award-Winning Belvedere, the Daley is a higher level mattress with a mid-level price tag; truly a bargain. Handles make it easier to flip (yes, it's double-sided!) and the new ventilated sides help keep the mattress from absorbing heat. With TempaGel, Tri-Zone Soft Posture Foam and 850 Tempered Pocket Coils, you can't go wrong.